What does it take to be a pretty horse? No one ask the Bronies, mind you. Many enthusiasts and experts look for a few things in a horses beauty, from the shine of their coat to their total bodily musculature, they even look at the mane and tail to see how those look! While many horses go to competition after competition to earn an honorific, here’s one that doesn’t even need to. 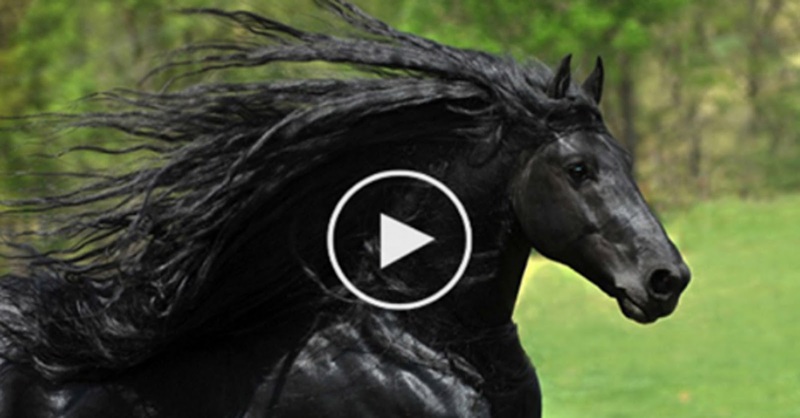 A breathtaking Friesian stallion from the Ozark Mountains in the U.S. may just be the world’s most handsome horse. Frederik the Great has an incredibly muscular build with one of the most beautiful, flowing manes ever seen. He’s like something out of a fairytale. His name is Frederick the Great, and by all rights and accounts he’s the most beautiful stallion in the world. He’s a Friesian from the Ozark’s living in the US now and even still, I don’t think I’ve ever seen a horse that looked any better. He’s got everything people look for in a horse and more, making him one of the most sought after horses around!